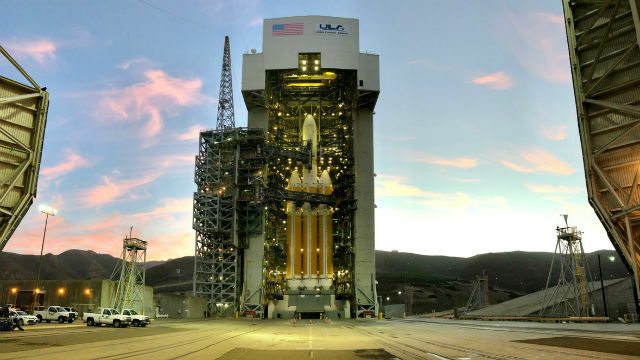 The delayed launch of a giant Delta IV Heavy rocket carrying a spy satellite for the National Reconnaissance Office has finally been rescheduled for Saturday. But the daytime launch at 11:05 a.m. from Vandenberg Air Force Base is unlikely to create a sky show over San Diego. A nighttime launch of the 233-foot rocket — the second most powerful in use after the SpaceX Falcon Heavy — was delayed five times in December. In one case the countdown was halted just 7.5 seconds before liftoff. The secret NROL-71 mission is being carried out by United Launch Alliance, a joint venture of Lockheed Martin and Boeing. Launches from Vandenberg after sundown typically create impressive aerial light shows over much of Southern California.